Which method will end up being successful? KOLON Industry’s preemptive attack or SKC’s latter attack? KOLON Industries and SKC are drawing attention by carrying out different strategies for their transparent polyimide (PI) businesses that are being promoted as their new driving forces. Not only is timing that they are targeting is different, they are also pushing for different strategies when it comes to manufacturing of film, which is an important element of transparent PI business. Timing of mass-production of transparent PI for KOLON and SKC is different from each other. While KOLON Industries is looking to mass-produce transparent PI this year, SKC is looking at 2019. KOLON Industries carried out facility investment in August of 2016 and is looking to complete construction of its plant by end of this month. On the other hand, SKC decided on investment last year and it is looking to bring in equipment by July of 2019 and start mass-producing transparent PI in October. Reason why there is a year gap between the two businesses is due to difference in their approach. While KOLON Industries focuses on grabbing upper hands through aggressive investment, SKC is being cautious and is waiting for relevant market to become vitalized. SKC believes that 2019 is the right time for mass-production as it believes that there is no reason to rush and mass-produce transparent PI when relevant markets are just starting to be established. Transparent PI is seen as a window cover for a foldable Smartphone. Because glass, which is used as window cover for current Smartphones, cannot be bent, it had been the biggest obstacle in development of foldable Smartphones. 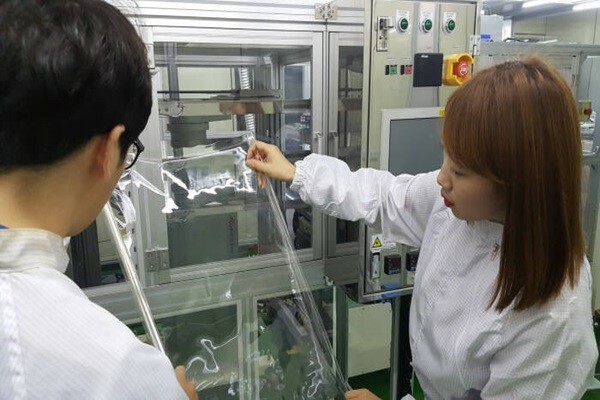 This is the reason why transparent PI is drawing attention from relevant markets and the reason why KOLON Industries, SKC, and Sumitomo Chemical are working on development of transparent PI. However, major role of a window cover is to protect a display from outside impact and this led to a question on how transparent PI film would be coated. Film with high degree of hardness that absorbs impact, does not get scratched, and does not change even when it is bent tens of thousands times had to be made through special coating. KOLON Industries and SKC again made different approach when it came to coating. While SKC is pushing for internalizing coating, KOLON Industries is looking to work with a company that specializes in this field. “Priority is to supply our films to a company that specializes in coating.” said a representative for KOLON Industries. However, KOLON Industries is also working to secure its own technologies for coating to prepare for increased number of customers that will request coating as well to KOLON Industries and when price becomes an important variable. SKC is planning to have SKC HT&M be responsible for manufacturing transparent PI films through high-hardness coating process. HT&M is a company that specializes in manufacturing optical films and was absorbed as a 100% subsidiary of SKC in 2017. 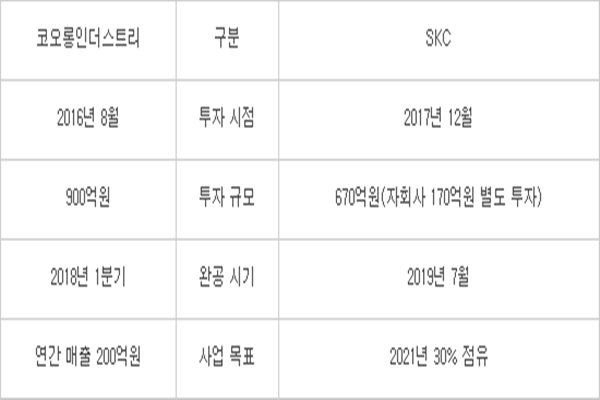 After SKC acquired 51% of SKC Haas Display Film from DOW Chemical for about $74.6 million (80 billion KRW), SKC changed its name to SKC HT&M. It is expected that there will be a winner in this battle sooner than later. Samsung Electronics is pushing to mass-produce foldable Smartphones within this year. Industries are interested on who is going to obtain the right to supply their transparent PI to Samsung Electronics and fruits of transparent PI market that will be established with foldable Smartphones.